By Blue Cube	on Wednesday, 23rd Jan 2019	in News, Troubleshooting - Hot Tubs. You’ve come here looking for alternatives to chlorine in your swimming pool or hot tub, you love to swim but no longer want to use chlorine. Whether that is because of the way it smells? Or it is starting to irritate your skin? Or you would like something a little more environmentally friendly? You’ll be happy to know that there are alternatives including some other chemical sanitisers but also more natural products. Below we’ll discuss the chlorine alternatives and ways to reduce chlorine levels including their pro’s and con’s. Firstly, let’s look at Bromine, it is another chemical and works is a very similar way to chlorine as it kills bacteria and harmful contaminants that may end up in your pool water. However, bromine is more stable in hotter temperatures which is why it is a preferred sanitation method for hot tubs and spas. For those who suffer with sensitive skin, bromine is better alternative as it is not as harsh as chlorine and does not smell as strongly as chlorine. Although bromine costs more you tend to you less as it does not disappear once it has combined with the bacteria to neutralise it, unlike chlorine. Pro’s: Less smell, better for sensitive skin, lasts longer, just as effective as chlorine. Con’s: More expensive, still a chemical, takes longer to remove the bromine smell from your skin. Active oxygen (Aquablanc) is a sanitation system which uses Hydrogen Peroxide or Potassium Monopersulfate. It works in a very similar way to chlorine and bromine as it kills bacteria and breaks down contaminants in your water but unlike chlorine it does not produce by-products which are often the cause for irritated skin, red eyes or that chlorine smell, it also dissipates quickly. Active oxygen is recommended for private domestic pools which are well maintained and looked after. It is not as strong as bromine or chlorine and therefore thorough regular maintenance is required to ensure your pool and hot tub remains in a good condition. However, it has become increasingly popular in recent years since it is odour free and offers a gentle alternative to those with sensitive skin. It is particularly recommended for those with children. Pro’s: Gentle on skin, no odour, Aquablanc is an easy to use system, no more red eye. 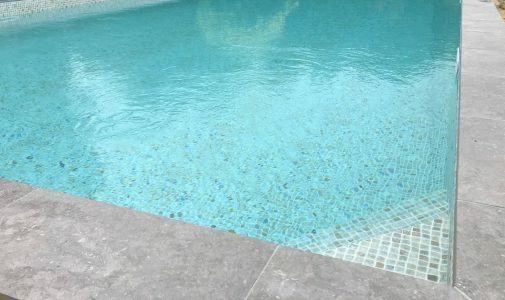 Now contrary to belief salt water pools do contain chlorine, unlike other methods of adding chlorine, saltwater pools use electrolysis to convert salt into chlorine and then back into salt, which means that if you are looking to completely remove chlorine from your pool this is not the way to do it. They do reduce levels of chlorine in the pool due to the continuous generation therefore you will not get chlorine peaks. These systems tend to be better for people who react to direct chlorine addition, your skin tends to not react in the same way, but it still contains chlorine. Pro’s: Save money on chlorine, gentler on skin. Con’s: It still uses chlorine to sanitise your pool. UV systems work by passing your water through a tube past a UV light which kills bacteria, mould and other nasty’s that may be floating in your water. You will still need to use a sanitiser, but you will need far less and can reduce your chlorine levels to around down to 0.5ppm. This will help reduce the irritation caused by chlorine and save you money on chemicals but the initial outlay for equipment and set up can be a little pricey. Pro’s: A great way to reduce chemical usage, a natural way to kill bacteria, long term solution with minimal time requirements. Con’s: Still need some chemical sanitiser, can be costly. Frog mineral sanitisers uses a combination of sanitising minerals and a very LOW level of chlorine which destroys bacteria. Designed for in ground pools up to 40,000 gallons. The minerals work continuously to control bacteria and keep your ph neutral to keep your pool water clear and clean for weeks. You can cut your chlorine use by 50%. Con’s: still need chlorine, needs changing every 6 months. A copper electrolysis unit such as the Blue Lagoon UV-C Ionizer is a great alternative to chlorine, it works by producing charged cooper ions which are attracted to negatively charged particles such as bacteria and algae. Once they have attached to these particles, they penetrate these particles and destroy them. Your water will be crystal clear and chlorine free. Con’s: Needs replacing after every two seasons, will require professional installation, can not be used in salt water pools.